Lambert & Rehbein was commissioned for the planning, investigation, design and project management for infrastructure upgrade works (Water Reticulation, Roads and Landfill) for the remote Queensland community of Pormpuraaw. Pormpuraaw is located approximately 500km North of Cairns on the western coastline of Cape York and is inaccessible to road transport for a significant period of time each year during the wet season. The vitally important project forms part of the Indigenous State Infrastructure Program (ISIP) aiming to provide increased quality of infrastructure services to remote communities. The project involves a collaborative approach between Lambert & Rehbein’s Civil Engineering, and Project Management Divisions and is currently progressing into the tender phase of the project. A key requirement of the project is for Lambert & Rehbein’s team to gain a firm understanding of community needs by providing regular contact and support to community stakeholders. The project continues Lambert & Rehbein’s commitment to working with the Department of Local Government (DLG) and remote indigenous communities. 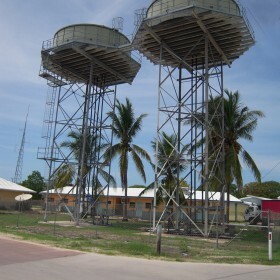 Previous projects Lambert & Rehbein has completed from the same program include, Djenghi Subdivision at Yarrabah, and Lockhart River Infrastructure Upgrades. Lambert & Rehbein looks forward to another successful completion of a major infrastructure project, and continuing our relationshop with the Department of Local Government (DLG) and remote indigenous communities in Far North Queensland. More information on our experience with Communities and Development can be found here.